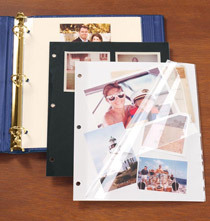 Exposures archival double weight 5 x 7 memo photo pocket pages are made of photo safe material which makes them the safest photo pocket pages available to protect your most precious photos. 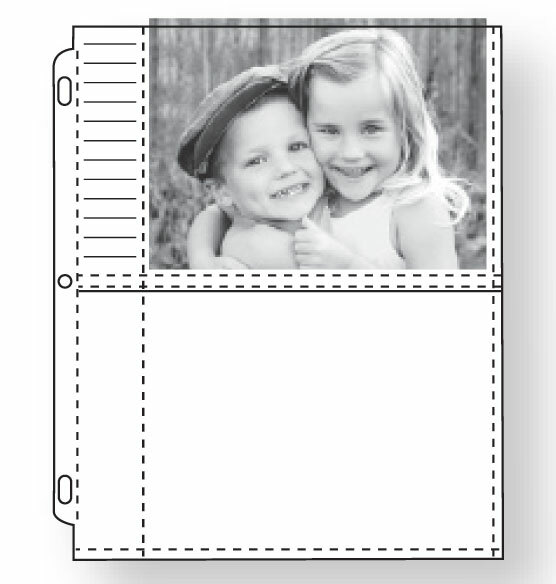 9 3/4" x 11 1/4"
I love that we can enhance the size of some of our favorite photos and store them just as neatly with our other smaller photos in the same album! I chose this for the memo area. It makes the date of every event easily remembered. I've used these pages for year. 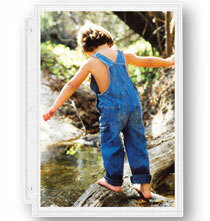 They are durable and hold up to the kids checking out their albums on an almost-daily basis! Have these and love them. I like having a page specifically for 5 x 7 pics, and being able to label the pictures is an added plus. I have many 5 X 7 pics to arrange in my new album. I have purchased these before and needed more. because not many places sell 5 by 7 albums. then i saw this and it makes sense in case i want to add different size photos. I have photo christmas cards that are printed on both sides. Have ordered them before and was very satisfied. I have albums for each of my kids and I put every class picture and team picture that they have ever had. I will then plan to give them their albums when they are older. I use this size and the 8 1/2 x 11 in my picture albums the most. These are great and I also love your picture albums. I have decided to take all my pictures out of their frames and put them into an album to keep on my coffee table for people to see. Four children, 8 grandchildren and 3 great-grandchildren filled my house with frames. I found your refill pages very reasonable. I chose this for yearly pictures with Santa. I leave the album on my coffee table every Christmas. The family loves looking at how the kids have grown through the years. BEST ANSWER: Thank you for your question. At this time we do not have a 3 ring page for the 5 x 7 that does not have a memo area. We hope this information will be of help to you and apologize for any inconvenience. Could you tell me the spacing between the ring holes? I'd like to use these in an already existing album that is unfortunately not from exposures. thank you. BEST ANSWER: Thank you for your question. It is 9/16” from top to first hole, 3 7/8” from first hole to second, 3 7/8” from second hole to third and 9/16” from third hole to bottom. We hope this information will be of help to you. The holes are 4 1/4 to 4 3/8 inches apart. I have an exposures Christmas memories album from several years ago and need refill (2 5 by 7 pages) for refills. Do you still have those to fit that album? BEST ANSWER: Thank you for your question. This is our only 5x7 page at this time. We hope this information will be of help to you. 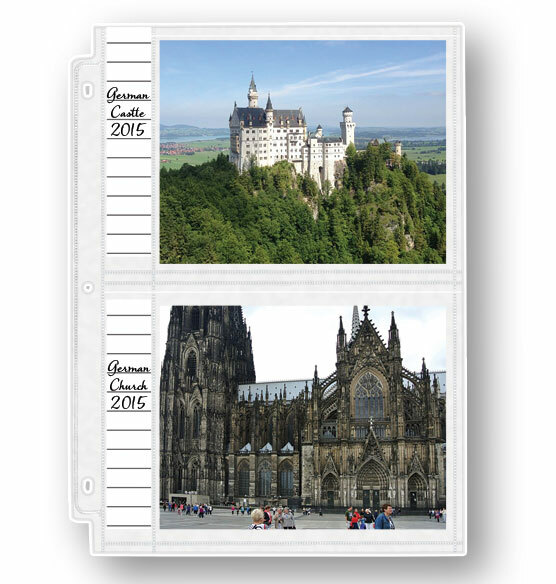 Are the pages clear or do they have a white backing? BEST ANSWER: Thank you for your question. There is a white backing. We hope this information will be of help to you. what 3-ring photo album do you have for this size page? BEST ANSWER: Thank you for your question. This page will fit most of our three ring albums. We suggest to read the item description on the album to make sure it does not need a specific page. We hope this information will be of help to you. I did read the album descriptions and that is why I asked the question. 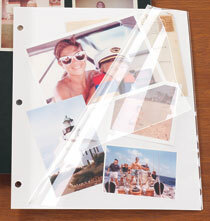 In almost every description I read the spec dimensions suggest that the album pages would stick out of the binder. I base this on an attempt to put the pocket pages in a standard 11" x 11.5" school type 3-ring binder. A typical binder has 2" rings (including yours). Put in the 9 3/4" x 11 1/4" album pages you can see this (9 3/4" plus 2" is 11 3/4". I can't find anything on your site except q 12" x 12" and I prefer something just a bit smaller. Where are the 5x7 pages with no pockets. I have used these for years would have stocked up if I knew they would no longer be available? BEST ANSWER: Thank you for your question. 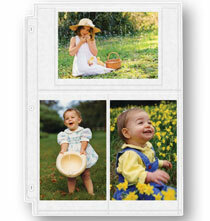 We carry pocket pages or sheet protector pages, which do not have pockets, but will need adhesive to mount photos. Please search keywords: Sheet Protector Pages to view them. We hope this information will be of help to you.